Flush with boldness in the wake of his breakthrough success with the 2013 album Kaleidoscope Dream and its Grammy-winning, million-selling hit single “Adorn”—and the equally popular hit “#Beautiful” with Mariah Carey—Miguel aims to transcend the narrow definitions of musical “normal” with Wildheart, his perfectly titled new album on ByStorm/RCA Records. 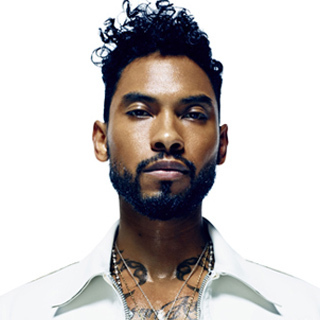 Miguel’s multi-faceted thematic approach to songwriting on Wildheart, and the interesting dichotomy of feeling connected vs. feeling lost, is epitomized by two key tracks, including “Coffee,” which paints a picture of a romantic night that whisks by like a beautiful blur, while “What’s Normal Anyway?” in which he expresses his desire to belong and not feel alone in a world where being of mixed race (Mexican-American father, African-American mother) is a greater challenge than it should be. The singer sees “What’s Normal Anyway?” as the spine of the album, the start of the journey to being “wild-hearted” driven by the answers to a small set of questions. These are: What do you stand for? What do you believe in? What are you willing to sacrifice? What are you not willing to sacrifice? He believes that when we take the time to answer those questions for ourselves, we arrive at another question: “What the F*** is normal anyway?” And yet another: Why are we striving so hard to appease other people’s opinions of what happens or what success is? “I say, ‘Throw away any need or expectation to conform to other people’s opinions, or perspectives, because the truth is normality farce.’ Normality is subjective. The moment we take the time to answer those questions for ourselves, what we stand for, what we believe in, what we’re willing to sacrifice, and so on and so forth, because we know who we are and where we stand, we’re more likely to make decisions that resonate with who we truly are, as opposed to making decisions based on other people’s opinions of how we move and act. That in itself is such an empowering and powerful disposition which I think is the position of anyone who has done or accomplished or thought of anything timeless, great, or of note. In addition to this sense of self-exploration, Miguel brings a lot of career momentum into the release of Wildheart and his 2015 summer tour, which starts in Austin and includes stops in Philadelphia, New York, Chicago and Los Angeles. The singer first hit the mainstream in 2010 with his single ‘All I Want Is You,’ from his major label debut album of the same name. The album’s other two singles were “Sure Thing,” which hit #1 on Billboard’s Hot R&B/Hip-Hop Songs chart and “Quickie,” which reached #3 on the same chart. Miguel’s single “Adorn” from his follow-up Kaleidoscope Dream hit #1 on two Billboard charts, Adult R&B Songs and Hot R&B/Hip-Hop Songs. The longest running #1 in the history of the Billboard R&B/Hip-Hop Airplay chart, “Adorn” won the Grammy for “Best R&B Song” and was nominated for Song of the Year and Best R&B Performance. Asked to explain his general process of songwriting and how he knows when he’s written a great song that will connect with the public, Miguel starts by claiming he doesn’t have a perfect response, adding “If someone has the answer, tell me, you know?” Upon further reflection, and hoping perhaps to inspire young songwriters who look up to him as an inspiration, he says the most important thing is truth. “Truth is often simple,” he says. I don’t know how to explain what truth is. But we all know what I mean when a truth is just very simple. It’s cut-and-dried. And that for me is what has worked the most, being true to my emotion and not editing, or watering it down to make it more palatable. I think your taste should inform the creativity.